I have read several stories about Holmes and Watson, but there are only two that really stick out to me. The first is Boneseeker by Brynn Chapman, which i adore. The second? A Study in Charlotte. And I am crazy in love with this book, and it's author, Brittany Callavaro! A Study in Charlotte follows James Watson as he is sent from his home in London, to a boarding school in the US, Sherringford. He has always dreamed of meeting Charlotte Holmes, made up stories about adventures that they would share. Like his great-great-great grandfather, Watson, James is a storyteller too. And now, after meeting the enigmatic Charlotte, he is sure that there will be plenty of stories to tell. But Charlotte is not at all what he was expecting. She is harsh, cold and judgmental. Their rare communications are always short and uncomfortable. Until the night one of his hallmate's is found murdered, and he and Charlotte end up with the blame. Now, they need to come together to solve these "Adventures of Holmes and Watson" murders before they both end up in jail. James "Jamie" Watson was a FANTASTIC character. More into books and writing than experimenting. but when it comes down to it he is ready to get his hands dirty. Funny and romantic, a big old softy, Jamie is easy to love. He and his father have a rough relationship, if you could call it that, but they are so much alike and you hope for a reconciliation. And when he finally meets his stepmom and little brothers, you know he is in. Charlotte is analytical and definitely harsh, but when you learn her story, her history, you can't help but fall for her. She is a smart cookie, and I envy her ability to know so many things from a few seconds in a room, or talking with people. Her family relationships are strained at the best of times, but she has her brother Milo. He is just as analytical as her, and unwilling to see Charlotte as the woman she is becoming. I loved all of the dynamic relationships in the story. From friendships, to parental and sibling relationships, to the relationships between possible suspects and the villain. And what a villain! I knew who was behind the murder and attempted murder, but then you learn that not everything is as simple as it seems. But that leads to what could be a sequel, and that is something I am very much hoping for! I am a HUGE fan of Brittany Callavaro! I am looking forward to whatever she brings us next, and have no doubt that she will blow me away yet again! 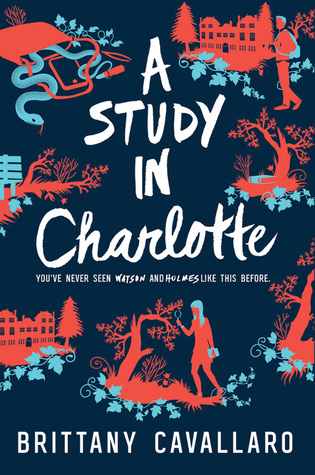 If you are looking for a funny and light-hearted mystery that turns out to be deeper and darker than you could every expect, look no further than A Study in Charlotte. It is a story that I absolutely recommend, from the bottom of my heart! Thank you to Around the World ARC Tours. As always, you rock my socks!